Bonnie Anderson is back, with her brand new single ‘The Ones I Love’. It marks a stylistic departure for the Sony stable starlet – into a more edgy dance/pop arena. So we thought we’d touch base with Bonnie to find out how the single came to be, how the album’s coming along and how she’s grown as an artist since her breakout smash ‘Blackout’ two years ago in our latest Q&A. Q. What have been some of the largest obstacles you feel you’ve had to overcome to get to where you are now? A. There are challenges everyday we have to over come, personally and career wise. I love a challenge and want to be the best version of myself everyday. It’s a matter of making mistakes, learning from them and growing. The music business isn’t an easy business, just like many others, but its fun and challenging and I get to do what I love most everyday… and that is to sing! Q. Do you feel there’s been a bit of a stigma attached to your career because of your ‘AGT’ past? If so, what have you done to shake it off? Q. How do you feel you’ve grown as an artist since ‘Blackout’? A. I have grown so much and as a song writer and as an artist, totally! I feel as though I am more honest and true to the person I am! I guess I was a bit younger and tried to fit in a little… It’s important for people to understand me for the person I am! I guess teenage years can be challenging in the way of being something you are not, you have to embrace what you were born with and be that and the best version! Q. What are some of the biggest lessons you’ve learned over the past couple of years? A. That the days turn into nights, weeks turn into years and you have to take everyday as it comes… and make the most of it! There has been a lot have learnt in the past two years. They’ve probably been the craziest years of my life in so many ways. I have learnt to be happier in my own skin, and accept that life is a rollercoaster… Sometimes I don’t even understand the lows, but you have to push through to enjoy the highs… I have definitely become so much stronger within myself. And also, continue to be yourself, learn from your mistakes and be kind to people. Q. Tell us about your latest single ‘The Ones I Love’, what inspired it. A. ‘The Ones I Love’ came to me in a dream. I had just moved away from my family home, and started to have some wild dreams. This one in particular woke me up and reminded me how precious life is and that it doesn’t go on forever. It’s really about embracing the ones we love, our family and our friends and making the most of your time with them, because life is too short. Q. Do you often recall your dreams? A. I love dreams, how some days I can wake up and remember exactly what happen and others I am kicking myself that I didn’t write it down on my phone or a notepad! As a song writer, dreams are totally awesome because they can be so outrageous and also sad, special, or totally weird! I love creating my dreams into songs! Q. What are some of the craziest dreams you’ve had that you can remember? A. Haha! I have definitely has some weird ones, ones I probably shouldn’t repeat! But I did recently have a dream about the Kardashians. We were all on a farm and there were chickens everywhere! It was a long story, but that is weird enough! Q. And what are your dreams for ‘The Ones I Love’? A. I hope it makes people feel good and I hope they can create their own stories behind the song and connect in their own way! I’ve already got really cool messages from fans explaining what they have gone through in their lives and have said to me that they can really connect with the lyric behind the song, which is so amazing for me. Q. Tell us about working with Michael Paynter and Michael DeLorenzis on it – and how the collaboration with them came to be. Q. What did you hope to achieve with the video? A. The video was a lot of fun, especially collaborating with Maybelline. Obviously incorporating their makeup, we wanted the video to be from my imagination verses my reality… “Could it be real”? Have people in the video having fun, dancing and loving life was what the flip side to what ‘The Ones I Love’ is about, embracing people and the ones I love. Q. What are the plans for the debut album at this stage? A. Still writing… and definitely keen to get more music out, but this year is all about hopefully getting another single out there as soon as possible! My favourite thing is engaging and connecting with my fans and more music means more of that, and I can’t wait for us to get to know each other, through the music and live shows etc. Q. ‘The Ones I Love’ is a stylistic departure for you…? A. It’s definitely got a ‘now’ sound. A Bonnie sound. It’s taken me a while, but I finally feel I have hit my niche! I feel like I’m in a good place and really happy with what we have been creating! The fun thing about being an artist means we can experiment and write things that we love! Q. Might we see a duet or two pop up in the future? If so, who with? A. I would love to do a duet at some point. I love singing with other amazing artists and definitely would love to work with Justin Timberlake or Ed Sheeran. I just finished doing a few shows with G-eazy and it was so much fun. It would be great to write with him and do something awesome together! Q. Which other artists are you listening to at the moment? I have discovered the world of Spotify as of late, so I have been listening to so much different music that I am totally loving at the moment. I am very much into that electro deep chill kind of music haha.. if that is even a thing! People like Flume, Kiiara, Zara Larsson are super dope at the moment, and Rihanna is always killing it! A. Definitely something that going to make me wanna dance – ‘Say Something’ by Karen Harding (the Zac Samuel remix). A. Maybe some of my own songs haha! Like I said O have become totally personal and honest with everything I do these days and there’s nothing more personal for me to listen to! A. Some rock n roll or some old soul throwbacks. Love a long ride listening to the old stuff… Sam Cooke, Michael Jackson. Q. Do you have any live appearances coming up? Shows? Instores? 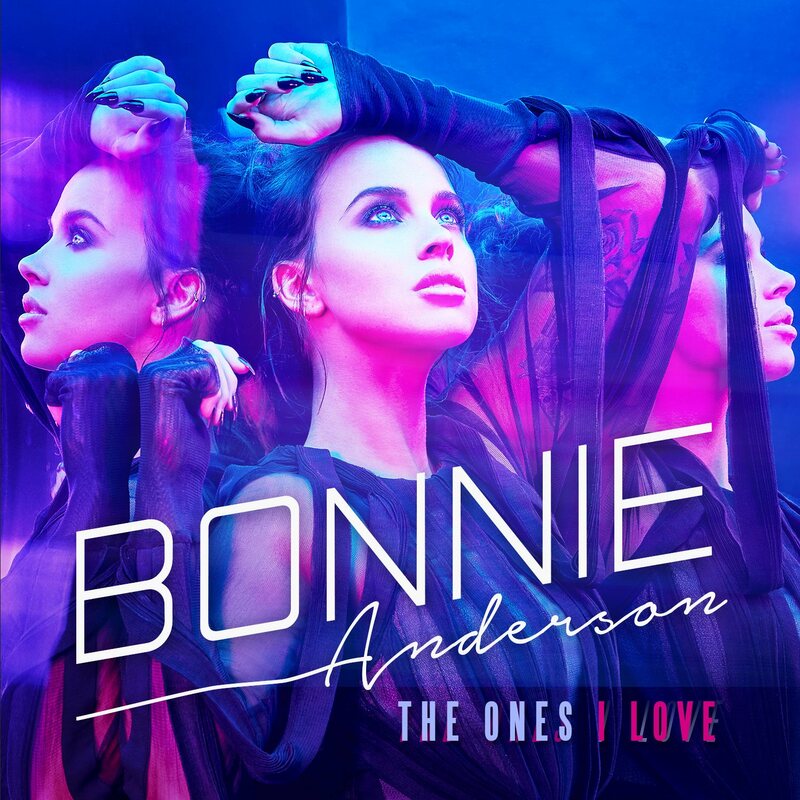 Bonnie Anderson’s new single ‘The Ones I Love’ is available now.